Special teams are an important aspect of winning football games in the NFL. At Pro Football Focus, we are uniquely positioned to evaluate the kicking game, as we extend our grading of every player of every play of every game to this aspect of play in addition to offense and defense. Last season we created a rating algorithm to rank special teams units based upon these unique grades, and during the offseason we updated the method. We plan on providing these rankings every quarter of the season, with the picture painted by these rankings likely clearer with each passing quarter. Below is the second such installment of these rankings. Going into the 2016 season, the Vikings had two former (and one current) All Pro special teams performers on their roster in Blair Walsh and Cordarrelle Patterson. Fast forward to 2017 and both players are gone, but the Vikings special teams are the league’s best. While Kai Forbath (21-of-22 on field goals) and Ryan Quigley (12th in the league in overall punting grade) have both been upgrades to Walsh and Jeff Locke, this ranking is all about the Vikings core special teams group. Players like Kentrell Brothers (seven total tackles), C.J. Ham (seven), Ben Gedeon (five) and Marcus Sherels (five) have combined for only two missed tackles as a group, while Jayron Kearse has been great as a gunner in his second season, adding two tackles himself. Long snapper Kevin McDermott has only one negatively-graded snap all season to round out the group. The second-best team in our PFFELO rankings is also the second-best team in terms of special teams so far. Rookie kicker Jake Elliott has been a revelation, making five of his six attempts from 50 or more yards, while forcing an average starting field position of the 23.4 yard line on 53 kickoffs so far. Kenjon Barner has the third-highest graded punt returner in his six games played, averaging over 11 yards per return while settling for only six fair catches. Kamu Grugier-Hill leads the team with seven total tackles in coverage. Not a whole lot has gone well for the Niners, but their special teams have been a bright spot. Bradley Pinion is the third-highest graded punter through nine weeks, generating the eighth-highest net punting average on his 52 punts. Raheem Mostert and Adrian Colbert have combined for 11 total tackles in coverage units, while Trent Taylor is in the top 10 among punt returners in our grading. Veteran Robbie Gould is having a good first season in San Francisco, hitting 18-of-20 field goals through nine games. Combing through the data, it’s difficult to find a metric that points to the Dolphins being as good as their 4-4 record suggests. Here’s one. Cody Parkey has been the best kickoff man so far this season, holding opponents to an average starting field position of the 20.4 yard line. This nontrivial field position advantage is in no small reason due to perennial special teams ace Michael Thomas (six tackles, no missed tackles), who continues to via for our All Pro Team on a season-to-season basis. The Ravens are always going to be in this conversation for one reason: Justin Tucker. The all-world kicker hasn’t had the crazy season beyond 50 yards that we’re used to (“only” 3-of-5 from that distance), but is 14-of-15 from inside 50 yards and is among the leaders in average starting field position allowed (22.8) on kickoffs. Michael Campanaro has provided juice as a punt returner, averaging 13.8 yards per return and scoring a touchdown against the Bears, while Sam Koch has generated a touchback on only two of his 48 punts through nine weeks. At 5-3, the Bills have been winning games on the margins all year. Free agent pickup Stephen Hauschka probably makes the Seahawks regret letting him go, connecting on all five of his kicks over 50 yards through eight weeks, and on 16-of-18 field goals overall. Brandon Tate has averaged more than 11 yards per punt return, while Lorenzo Alexander, Matt Milano, Joe Webb, Colt Anderson and Andre Holmes have all produced four or more tackles in coverage. The Chiefs are relative mainstay in the upper echelon of the league’s special teams units. While Tyreek Hill has been great in a pinch (including returning a punt for a touchdown against the Texans), the biggest story for the Chiefs’ special teams has been the play of Harrison Butker. Signed before week 4 to replace veteran Cairo Santos, Butker has made 19 straight field goals and produced 30 touchbacks on 38 kickoffs. In a weird start to the Falcons’ season, special teams are another area where the analytics say Atlanta should be performing better than their record indicates. Matt Bryant has continued his strong career, going 4-of-5 beyond 50 yards thus far, while punter Matt Bosher is one of only five regular punters with zero touchbacks through the season’s first nine weeks. As anyone who watched “All or Nothing” this offseason can attest, the Rams put a lot of thought into their special teams. That work is paying off, as players like Cory Littleton (four total tackles) and Cody Davis (three) have graded well so far as blockers and in coverage. Pharoh Cooper has the second-highest grade among return specialists, averaging 30.9 yards per kickoff return and 11.3 yards per punt return. Greg Zuerlein leads all kickers with 24 made field goals in 25 attempts. While a first-round pick may have been a bit much for Adoree’ Jackson as an overall player, he’s provided a huge boost as a return man, averaging more than 10 yards on 16 punt returns, with a long of 46. He’s the highest-graded return man in the league to this point, while Ryan Succop is second in the league with 21 field goals made (and he’s a perfect 20-of-20 inside of 50 yards). Bill Belichick has long prided himself on playing good special teams, and this New England bunch has been no exception. Stephen Gostkowksi’s average kickoff is a perfect one yard into the endzone, while their opponent’s average starting field position is the 23 yardline. Over the course of Gostkowksi’s 48 kickoffs, those yards add up. While the loss of kicker Dan Bailey the last few weeks has hurt Dallas, their special teams remain strong. Chris Jones has kicked only one touchback and allowed only 54 return yards on his 31 punts, good for third-fewest in the NFL. Byron Jones, Rod Smith, Keith Smith and Kavon Frazier have been great in coverage, combining for 19 total tackles while missing only three as a group. Jamal Agnew has been one of the great surprises in the league so far this season, returning two of 15 punts for touchdowns for a sizzling average of 19.4 yards per return. While punting has been something of an issue, both because of injury and subsequent performance, Matt Prater has been his usual self, leading the league in our field goal/extra point grading through nine weeks. 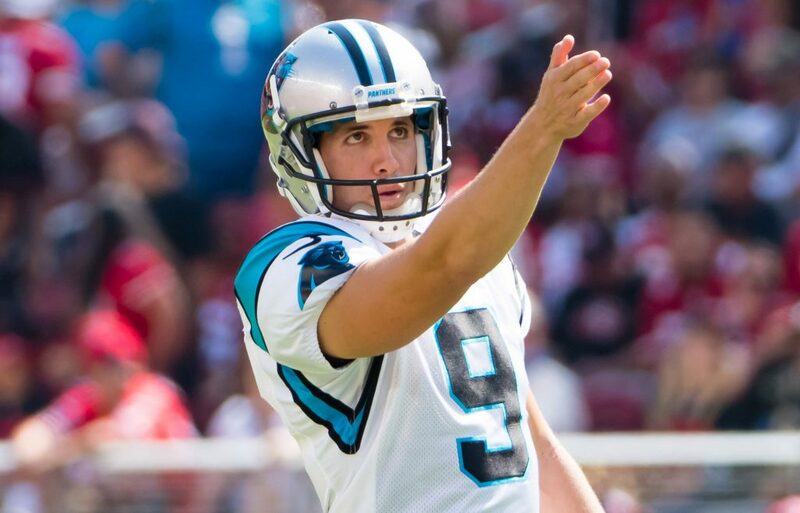 Kicker Graham Gano has made 19-of-20 field goals so far, while Michael Palardy is our sixth-highest graded punter for the surprisingly 6-3 Carolina Panthers. Losing Ted Ginn in the return game has not helped them, as they have averaged only 6.5 yards per punt return and 21.1 yards per kick return. If Christian McCaffrey and Curtis Samuel can adjust to the pro game in this department, watch out. While Chandler Catanzaro has had some difficulty between 40 and 49 yards (he’s 9-of-13), he’s generally graded well, and Lac Edwards has forced the seventh-highest number of fair catches among punters (12) in his second season. The return game has been poor, averaging just 6.0 yards per punt return and surrendering a key fumble two weeks ago to the Falcons in a game that went down to the wire. Losing Pat McAfee (perennially one of our highest-graded punters) to retirement was a blow, but the Colts have improved on special teams since the season’s first quarter. McAfee’s replacement, Rigoberto Sanchez, has the fifth-best grade among punters through nine games, surrendering returns on just 26.0 percent of his kicks, which is the second-best mark in the league. While special teams almost cost the Bears a game in Baltimore, there have been some bright spots through the season’s first half. DeAndre Houston-Carson and Benny Cunningham have combined for nine tackles through eight games, while Sherrick McManis has continued to play well as a gunner and a vice, blocking a field goal against the Steelers in the process. While they’ve struggled to kick field goals and extra points over the past two years, and a blocked punt last week against the Saints really buried them, the Buccaneers do have some bright spots on this side of the ball. Bernard Reedy has our seventh-highest grade as a punt returner in his first season, generating a 10-plus yard return in five of his eight games so far. Punter Britton Colquitt has been good so far for Cleveland, posting the seventh-best net punting average (43.2) through eight games. Coverage guys Mike Jordan and Sammie Coates have been good additions, combining for six tackles (and no missed tackles), while Emmanuel Ogbah was able to block an extra point against Minnesota in London. The Steelers have gotten positive play from guys like Tyler Matakevich (eight total tackles), Roosevelt Nix (three), Mike Hilton (six) and Coty Sensabaugh (four) in coverage and as blockers in the return game so far. This has somewhat made up for the difficulty punter Jordan Berry (second-worst in net punting average) has had flipping the field so far. Free agent acquisition Blair Walsh was largely keeping it together until last week, where his three missed field goals were the difference in a three-point home loss to Washington. The league’s second-lowest graded kicker on field goals and extra points has not let placekicking affect his kickoffs, which have led to average opposing starting field position at the 23 yard line so far, one of the better marks in the league. If Denver is going to climb out of their hole, they are going to have to do so by winning low-scoring, close games. The problem is that Brandon McManus has not been his usual, reliable, self, missing five of 18 field goals so far. Couple this with the fact that return man Isaiah McKenzie has had difficulty hanging on to the ball, and it’s not difficult to see how Denver is losing games on the margins. While this ranking is a bit low, there’s plenty to like about the Bengals’ special teams. Clayton Fejedelem is currently tied for the league lead in special teams tackles (10), while Alex Erickson is the eighth-highest graded return man through his team’s first eight games. If replacement kicker Marshall Koehn can capitalize on the promise he showed during the preseason, the Bengals might move up in the next version of this list. He may have changed uniforms, but Cordarrelle Patterson is still the standard-bearer among kickoff return men in the league. He’s graded out as the third-best player at that position so far, generating a return 30 or more yards in seven of nine games so far, and a return of 40 or more three times. While they’ve fallen in these rankings during the season’s second quarter, the Saints special teams generated a touchdown on a blocked punt against the Buccaneers last week – helping move their sixth-straight win in the right direction. While it hasn’t materialized yet, having Ted Ginn Jr. and Alvin Kamara available as return men will likely pay dividends for them moving forward. While the Jaguars have had an impressive start to their season, special teams have largely not been a part of that rebound. Against the Rams they surrendered two special teams touchdowns, putting the Jaguars offense too far behind the eight ball with their limited offense. If Josh Lambo (perfect on his first 10 total kicks since joining the Jags) can continue his strong start for his new team, things might turn around nicely for Jacksonville’s special teams. It’s going to be difficult for the Texans to win games moving forward, and special teams will likely not help the cause. Shane Lechler has been a continuous bright spot, though, generating the third-highest gross yards per punt (50.2) while earning the sixth-best grade among his position group. Kurtis Drummond has added six special teams tackles while grading well in coverage. Like the Texans, the Giants don’t have much to look forward to moving forward. Rookie kicker Aldrick Rosas has struggled (8-of-12 on field goals) in limited opportunities, while punter Brad Wing is the second-lowest graded regular punter through nine games. Veteran Kerry Wynn has been a bright spot, grading well in multiple phases of special teams. When it rains it pours, and deficiencies across the roster have been magnified with the loss of Aaron Rodgers in week 6. First-year punter Justin Vogel hasn’t graded as well as some other punters, but has net average of 44.1. Mason Crosby has the third-lowest field goal/extra point grade among full-time kickers, missing two extra points in a Week 5 win at Dallas. After some late, close losses, the Chargers jettisoned rookie kicker YoungHoe Koo and welcomed back veteran Nick Novak. Similar results have ensued, as Novak has yet to make a kick over 40 yards. Like Koo, Novak has struggled to contain returners, generating an average starting field position of 29.3 on his 16 kickoffs, by far the worst in the league. Washington has had a ton of difficulty in the kicking game, and in no place was this more glaring than the blocked Nick Rose field goal against Dallas that served as a 10-point swing in what was an important divisional game. They’ve also struggled mightily on returns, averaging only 5.0 yards per punt return and 18.9 yards per kickoff return, with the longest return of either a punt or a kickoff registering at 24 yards. As we saw in the Thursday night game, poor decisions and play on special teams can cost you points, and having the worst special teams can cost you many points over the course of the season. Phil Dawson has been the most-glaring issue for the Cardinals on special teams, grading out as our worst kicker on extra points and field goals, missing six of 18 kicks so far.